The script displays information about the trade account and the current financial instrument. Trade Allowed - shows whether trading is allowed for the current financial instrument. The script doesn't have input parameters and it doesn't trade. There is a free version of this app. Unlike the full version, it displays the information about the trade account only (no information about the current financial instrument). 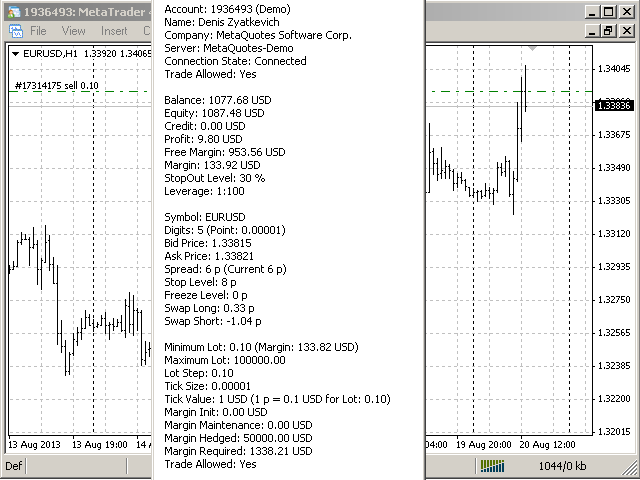 There is also a free version and a full version of the application for MetaTrader 5 that have the same features. The developer of Account Info for MT4 is not responsible for possible modification or termination of the program's operation due to changes in MQL4 used for developing it made by the trading terminal and language developer - MetaQuotes company. The developer of Account Info for MT4 is not responsible for any loss, damage or missed profits caused by the use of the program, its work or malfunction. If you have any questions about the application, comments on its operation or suggestions for future improvements, please send them by email or leave your personal messages via this web site. Let me know what products (Expert Advisors, indicators, scripts) you would like to see.